I cook chicken tacos all the time! In fact, I cook them so much I was getting tired of them. There are only so many ways to make a chicken taco taste good. But…this weekend my family asked for chicken tacos…yet again! I decided to take a little inspiration from a cookbook I have. 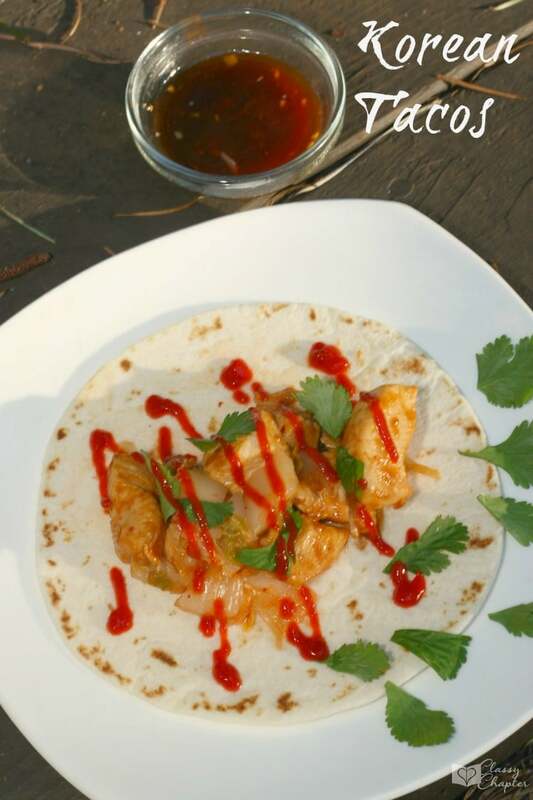 The end result was this amazing Korean taco recipe. If you love these then take a look at my other easy home cooked recipes. Not only are these tacos absolutely delicious but this recipe cooks up in under 30 minutes. Major win! Combine soy sauce, lime juice, brown sugar, ginger, garlic, cornstarch, Asian chili sauce and rice wine vinegar in a small bowl. Heat oil in a large skillet over medium-high heat. Make sure the oil gets nice and hot! Once the oil is hot add chicken to the skillet and cook until the meat is no longer pink in the middle. (About 10 minutes). Once your chicken is cooked through, turn down the heat and add the sauce and stir-fry together. Make sure the sauce is even distributed over the chicken. Cook together for about 3 minutes. While the sauce and chicken are cooking do a rough chop on the kimchi. Add kimchi to the pan during the last minute of cooking just to slightly warm the kimchi. Serve with flour tortillas and cilantro. My husband likes to drizzle Sriracha sauce over his taco, this is totally optional but keep in mind it kicks up the spice by like a 100! If you enjoyed this recipe make sure to check out some of my other favorites! I’m really not a big fan of the Kimchi…but it did give the tacos a nice flavor. Super yummy, even my 5-year-old liked them! Yes, for sure! I’ll head on over. Thank you for letting me know! Sounds delicious. Thank you for coming to the Inspire Me Monday Linky party! Thank you! They are so easy to make, you’ll love them.